This system is able to heat a small sample with hot gas up to 1,000°C with a precision of ±1°C. Mains : 110 / 220 V – 50 / 60 Hz – 1000W. This instrument can be installed on a four circle X-ray goniometer for temperature dependent crystallographic studies. Control cabinet including Eurotherm temperature controller/regulator, and a gas flow meter. 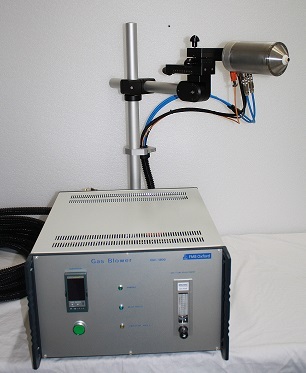 The gas blower system is principally used for heating samples in diffraction experiments. The 5mm diameter version is useful for single crystal diffraction (single crystals are not larger than 1mm, normally 0.2mm) whereas the 8mm diameter version is useful for powder diffraction.